Greetings to All Around the World! ! ! ! ! ! ! Well its been a while now that I was Gone from Moderating/Administrating the Rooms as some of you know from my last Blog I was out due to Health issues and Thank God I was able to over come All of them! not only that but since I was getting checked by the doctors they checked Everything Blood, Colonoscopy, Endoscopy, my Feet I mean they did not leave Anything unchecked! and I Am Now Happy to Report that I am Now Healthier than Ever! and I was also able to Rest for some Time and I was Able to get Closer to God I was able to Read the Bible in its Entirety for the technically 3rd Time now! and My Spiritual Knowledge and relationship with God has Grown to New All time Highs! But I thank God that I have been searching for him and Knocking at the Door Day and Night day after day for a long time now he has Protected my Health and Guided me to be at now My Healthiest I Have Ever Been! Spiritually and Physically so now I honestly Feel that I should God willingly Live a Long and Healthy Life as long as I Stay with God! it is written he will extend your life here right now if you live according to the Scriptures and not only that he will Bless you in Many ways and those who help you and he will also Bless you in what comes Next after this Life if we Plant those Spiritual Seeds here in this Life thus accumulating Riches in the Heavens were no thieves can take them away etc.. I appreciate that some of you have Kept in touch with me thru Calls, Texts, and Comments on my May 17th Blog Your Love and Your Prayers Have not been in vain and they have helped me get thru This situation! Thank You So much! From the Bottom of my Heart! So Now I have been sending emails letting Profit.ly know that I'm Better now and can Return to Help Organize the Rooms and keep them in Order and with Higher Quality Alerts how I have Always done for Years now and I keep getting told to " take some more time off to be Healthy" and as much as I appreciate that! I really really miss the Trading community and Profit.ly Family World Wide! and I just cant stay away for too long with out feeling like there is Something Missing in my Life! =) so I wanted to write this Blog so that those whom have been asking about me World wide and whom take their Trading career Art form Seriously and Profession wont think that I have just disappeared nor am I milking the Situation at hand with my health, that's not the type of person I am, I have been trying to come back since last month already just so you know =) But I really do appreciate that my Health is Important to Profit.ly Family and Others! My Love Goes out to You All! and my Prayers! Ok well I Inserted the Image up there as an Example of what a Picket is! 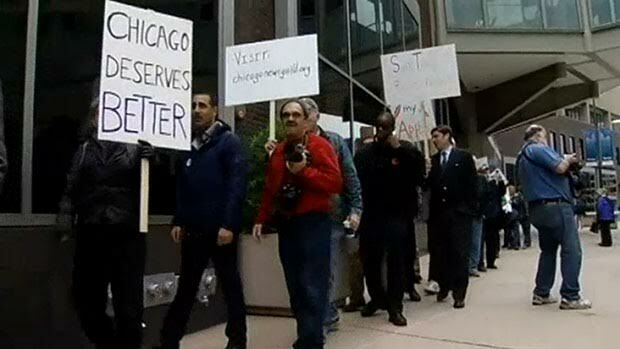 lol =) so if you want to Support the Virtual " We Want Chicago777 Back" Picket then Leave a Comment down Below! and Share it with Others! and have them Leave a Comment each comment is like a Signature of Support! you don't have to say Much you can even type just "Chicago777" to be Quick and Simple! Your Signature shows Support that the Community World Wide wants to Have the Room in Order and Rules enforced and Gags handed out and Someone who has helped from the Heart for sooo many Years now! Your Help and Support and your Love is Much Appreciated! Love You All World Wide! So Mega Phone ON! " Who do you Want?" " Chicago777 Daniel!" "What do you want!?" " We want him Back!" I cant Hear YOU! " Who do you want!? " Chicago777" what do you want!? " We Want Him BAcK!!" lol Thank you for the Support Mega Phones ON Guys! its also a Fun Unique way of having a little bit of a Good time and Showing Support and Unity of our Trading Community Family World Wide! let your Voice be Heard! and during trading day you can even send " Chicago777 " Randomly as a Peaceful Protest lol well that one might cause more mayhem in room so I rather You All just Give your Signature Comment here in the comments Section on this Blog down there and Share it! and Give Karma but please don't just give Karma the Comment is Needed to show support! and if you are New and you have not seen Me in Action Trust me that when I'm around I organize and Put order in rooms for All to get a Better Quality Service for your Cash you pay a Month or paid yearly! Your Support will Benefit your Learning curve. Thank You All Again From the Heart! and Thank You God for Protecting me and my Health and Guiding me! Also just for a Bit of Fun I ran into some Interesting Commercials during my Time off while I was Healing but of course after Reading the Bible! and so I'm going to Include down here the Commercials I found Unique and Interesting, in No particular Order! and those that Know me Know that I Love to talk with Commercials lol =) Specially when the commercials are Unique! or Funny! or an Art form of a commercial, and special Note to those company's I'm up For Sponsoring! lol Whos Going to be First in Line to Sponsor Me! You wont Regret and you can be Part of a Story that will go down in History! the True American Dream! and I'm Loyal and you wont regret! and the exposure will be Great for us All! Step Up Step Up! who will be First! lol =) Love You All! Tesla - "We Will be Unified.. They will Gaze Up and will want to Find their Star in their Skies They will Marvel at how Vulnerable the repository of our Potential once was how perilous our Infancy, how Humble our Beginnings, how Many Rivers we had to cross Before we Found our Way "
Geico - " No body does Under Water Stunts.. Except me Ofcourse lol "
Intel - " Were Going to Be Friends don't be embarrassed of me Jim I'm getting excited about this! Were Going to be Friends! lol "
Intel - " There's some Napkins in the Glove Blox.. Ok but why would I need a Napkin? .. Bump! face in doughnut lol.. You could have just told me there was a Bump coming.. lol "
Mercedes - Dad and Son looking up at the sky A Shooting Star Streaks across the night Sky!....... and awesome music comes on =) " But Hurry these Shooting Stars Fly By Fast! as you can tell I had A lot of time on my hands to Heal lol But now " We Want Chicago777 Back!" Do Not Forget to Comment to Show your Virtual Support Love! " We want Chicago777 Back!"